They said that Doc Evans was a quiet, modest man who could have gone longer without food than music. For over half a centuryhe never used his first name PaulDoc made a living by what he called "stealing money for doing what you love." 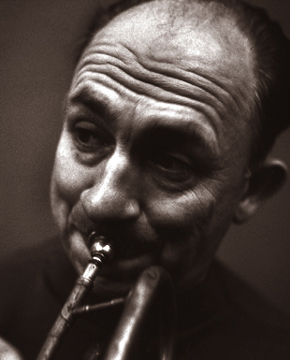 Once when asked about music and money, he said "I once put a hundred dollar bill in my cornet and it ruined the tone." Son of a Methodist minister, he was born June 20, 1907 in Spring Valley, Minnesota. As a child, he took piano lessons, played drums, and in high school played saxophone. Incredibly, these piano lessons were the only formal music training he had during his entire career. In the '20s he obtained a B.A. in English from Carleton College in Northfield, MN. While at Carleton, Doc played with Carleton Collegians, a campus group that played for school dances and various local events. His ability to play piano, sax and drums made him a particularly valuable member of the ensemble. He found a second-hand cornet and began bringing it along to dance jobs, where he would alternate between tenor sax and cornet. "Finally I decided that the cornet was my instrument, and I had to decide what to do about my saxso I gave it up." By the late '20s he was playing full-time with bands around the Twin Cities. During the big depression, traditional jazz music was already fading from the scene, but Doc scraped along, always listening, studying, and developing a personal cornet style. He hit his stride in 1940 when he put together the dixieland band that played at Mitch's in Mendota. Big name band leaders came from hundreds of miles to hear him; offers came from celebrities like Claude Thornhill and Ray McKinley. Doc turned them all downhe couldn't give up his two loves, traditional jazz music and the Midwest. In 1947 he made two celebrated albums for Disc Records which brought him national attention. Also in 1947, the famous Jazz Limited club opened in Chicago with Doc Evans leading the band. He decided to take up permanent residence in Chicago, and for the next five years, he was a prominent musician in Chicago's jazz scene. He played all of the major clubs, including the Beehive, the Tailspin and the Blue Note and he frequently returned to Jazz Limited. Then followed tours and engagements all over the country and recordings for Dublin, Joco, Soma and finally Audiophile, for whom he recorded extensively. He played in clubs and universities from coast to coast, making stops in Oakland, San Francisco, Los Angeles, Detroit, New York and Boston. With every engagement, his fame spread. Looking back on his time away from Minnesota, Doc would later comment, "I'd never have made it If I hadn't got out of town." He returned to Minnesota in 1952 where, with his new national reputation, he had little difficulty finding work. Doc was in demand for club engagements, his band toured the Upper Midwest under the auspices of the University of Minnesota Concert and Lecture Series and he opened his own jazz club, The Rampart Street Club. 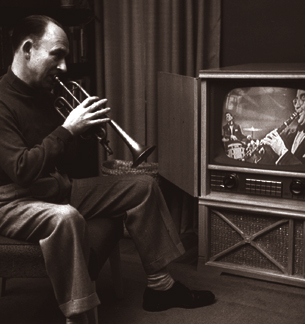 He also had a TV series called "This Is Dixieland" with a band that included pianist Knocky Parker. For ten consecutive years he played concerts to sold-out crowds at the Walker Art Center in Minneapolis. To him it made little difference where he playedat the Walker or sitting with his band on the sidewalk outside a university bookstore. "Jazz doesn't know where it is," Doc said once, "and it doesn't care." Friends tell of the charities Doc quietly played for to raise money. Of the handicapped kids he entertained one-on-one. Of the elderly people he comforted, for free, with "When the Saints Go Marchin' In." But one friend added gently, "Doc doesn't deserve any credit for that kind of stuff, he loved to play for anybody." A native and devoted midwesterner, Doc Evans took pride in forcing success to seek him out at home, and it seldom enticed him to stray far from his home base. He traveled some, playing with bands or leading his own, but not a lot. He made his choice early in life. "It's the classic decision for a fine musician," said friend and band drummer, Bob Byrnes. "You marry your horn and go on the road, make money, become famous, or you marry your wife and have a home life. For Doc, the decision was not hard." He stayed close to home, maintaining a happy suburban life with his wife Eleanor (who took cello lessons with Doc), and sons Jeff, Allan and Mark. Doc's interest in classical music led him to found the Bloomington Symphony Orchestra, which he conducted until his death. Jack Lucas, a close friend, wrote a poem engraved on a plaque to commemorate Doc's life and career which hangs at Carleton College in Northfield, Minn. It starts: "Blowing, growing to the last day" and the last line reads "He was his own man till the day he died." He has been called "the best to come along since Beiderbecke," an opinion still shared by many to this day.